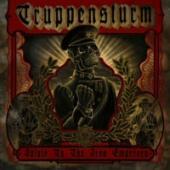 A new kind of brutality is promised on TRUPPENSTURMS new album. It´s all about war/black/death metal that plays in the key of grim, brutality and satanic vibes. Time to be convinced, on with the twelve tracks. The air raid siren sounds in “Obliteration of All Beings”, machine guns fire and there is marching music in the background. Then the muffled war metal hits off, with hardly audible vocals. The guitar is at the front of the mix, the drumming is way behind, and in the style of Abbadon (ex. VENOM). The sound is courtesy of Gnarl, and it´s ok, if this is your poison. Dark, chaotic and satanic, the info sheet is a100 % correct. The songs are betwixt 1.55 and 4.30, so they never get epic. The intro to “Antichrist Imminent!” creates some atmosphere, which the album badly needs. “NecroEucharist” follows suit, thanks for that. Some male choir opens “Triumphal Arch for the Dead”, the songs are easily varied. But still there is a lack of variation. “Gustav – The Great” has some growl (Darth Vader style) and pompous keyboards, before the smattering of the drums begins, opening for a complete tale over by the guitar. A short, snappy variation before they get back to the normal pace. I know that´s the foundation of blackened war metal, but I can´t applaud it. TRUPPENSTURM seem to have ideas, but they never let them blossom. I still think that VENOM`S debut single was better, brutality rarely changes.